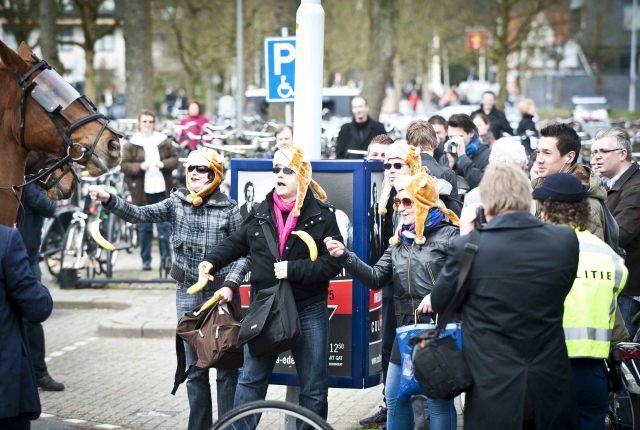 March 26th 2011 - Saturday, March 26th was a beautifooool day to launch the 'National Bananas Front' in Ede. Of course there was also a march of neo-nazi's. Shortly after 13.00 the leader of the Nederlandse Volks Unie (Dutch Peoples-Union) started his speech. But it didn't take long before the 'National Bananas Front' also started their far better campaign: "Own Bananas First!" 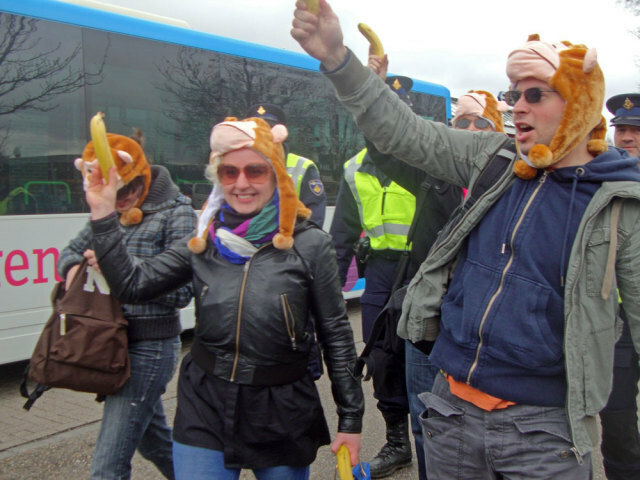 The real Big Issue should be to stop the foreign bananas entering the Netherlands! 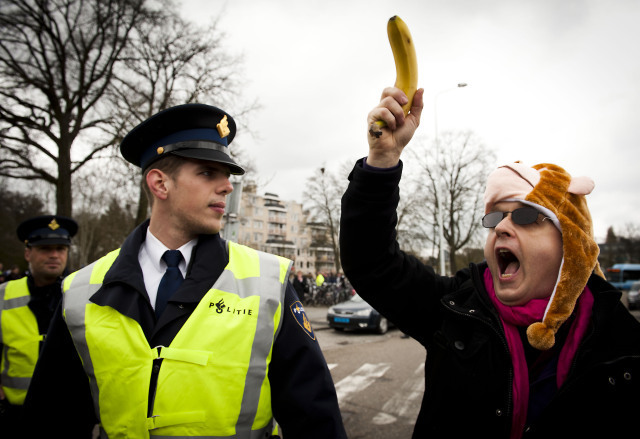 "This country needs order - this country needs Dutch bananas!" To make that message clear some enthusiastic members of the National Bananas Front held their own speeches and shouted lines about Dutch bananas. The media attention for that guy from NVU was gone. First things first - the media now followed the start of the campaign for Dutch bananas: "Dutch bananas should be protected! No more bananas from abroad! 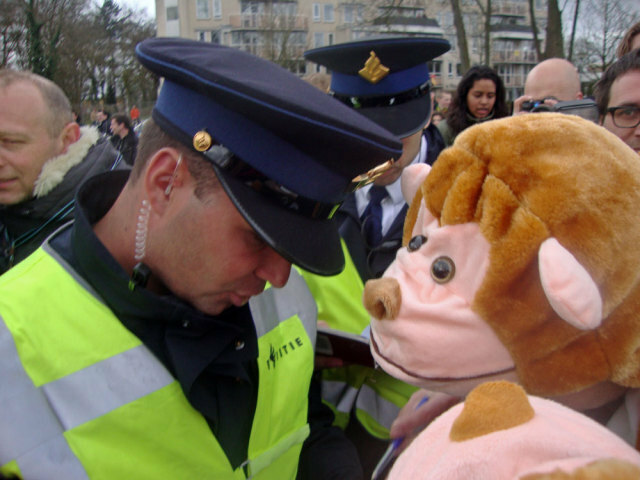 The Dutch borders should be closed immediately for all foreign bananas!" 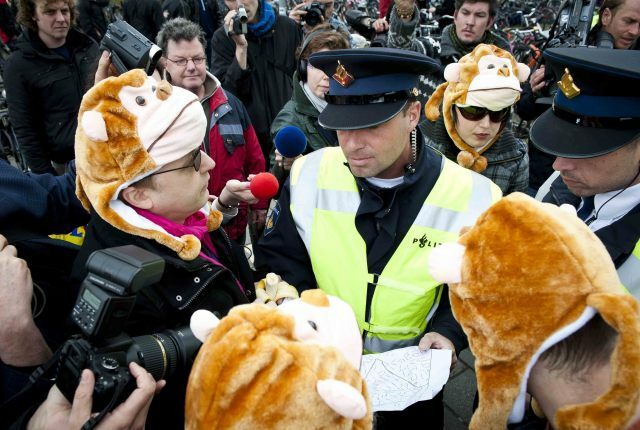 The National Bananas Front demonstrated in a very clear way how tasteful Dutch bananas are by offering them to people from media and police and throwing them in the direction of the NVU. 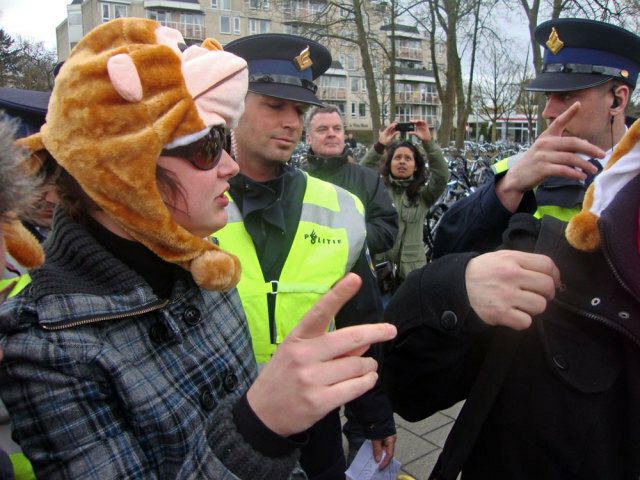 More than 70 Dutch bananas found their (extreme) right way! It was surprising! 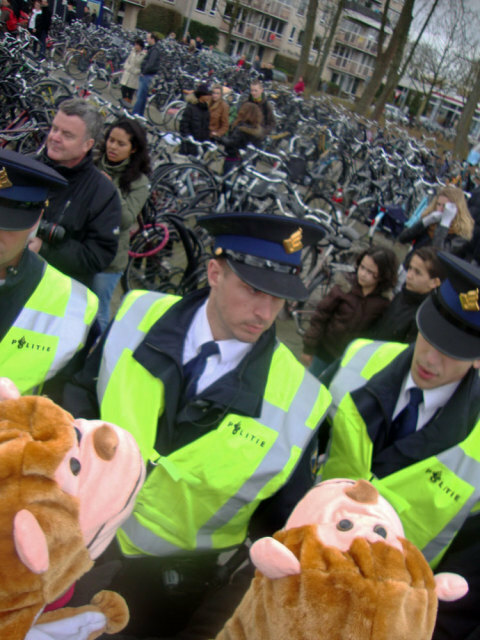 Even for the police horses; they never saw so many bananas flying above their heads... The police on these horses tried to stop the campaign, but first without success. It took a while because the members of the National Bananas Front were surrounded by journalists, photographers and filmers. Clownfusion all over the place; for the police and also for the neo-nazi's. The media were clearly more interested in the exciting bananas campaign than in that boring speech from NVU-leader Custers. 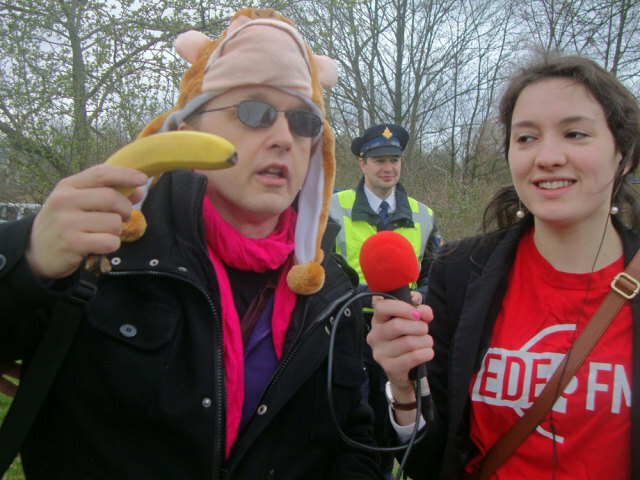 Finally the improvised 'pressconference' had to stop and around 13.30 the police accompanied the members of the National Bananas Front beyond the Klinkenbergerweg in the direction of the woods east of the train station. 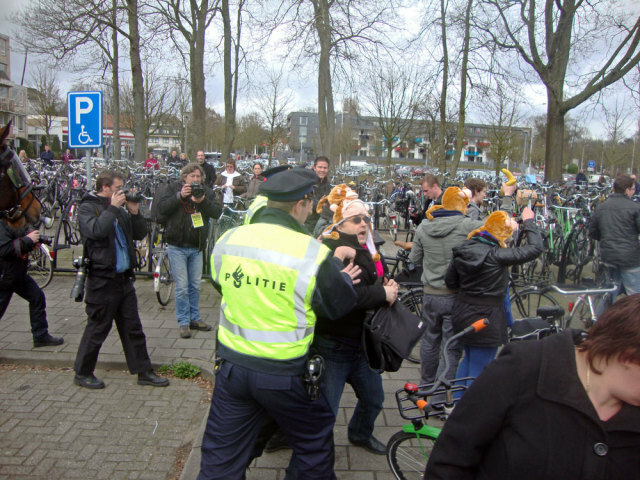 Although the police made clear they also support our delicious Dutch bananas, they ordered the National Bananas Front to don't re-enter the neighbourhood where the nazi's were marching. The National Bananas Front followed the orders. What else should we do? !